Separate the egg yolks and whites and place in separate bowls. Beat the yolks. Whip the egg whites vigorously until they’re stiff- this takes about 15 minutes. Combine the flour, baking powder, sugar, and salt in a large bowl. In a separate smaller bowl, combine ½ cup of vegetable oil, milk, egg yolks, vanilla, and maple syrup. Pour the wet mixture into the middle of the flour mixture and stir until combined. Fold in the egg white and mix but don’t overdo it, you want the egg whites to maintain their stiff texture. Heat oil in a high-walled skillet (I used a dutch oven) over medium-high heat. To see if the oil is ready, test it by dipping the end of a wood spoon into the oil. It’s ready if the oil bubbles around it after a few seconds. Lightly coat the chicken in flour, then dip in the batter. Use two forks to gently lift the chicken up (without poking it) and drop it delicately into the oil. You may need to do this in batches. Fry the chicken until it’s a nice golden brown all the way around. This took about 15 minutes for me but keep a close eye on it. Adjust the temperature of the oil as needed so that the chicken cooks gradually, and not too fast. 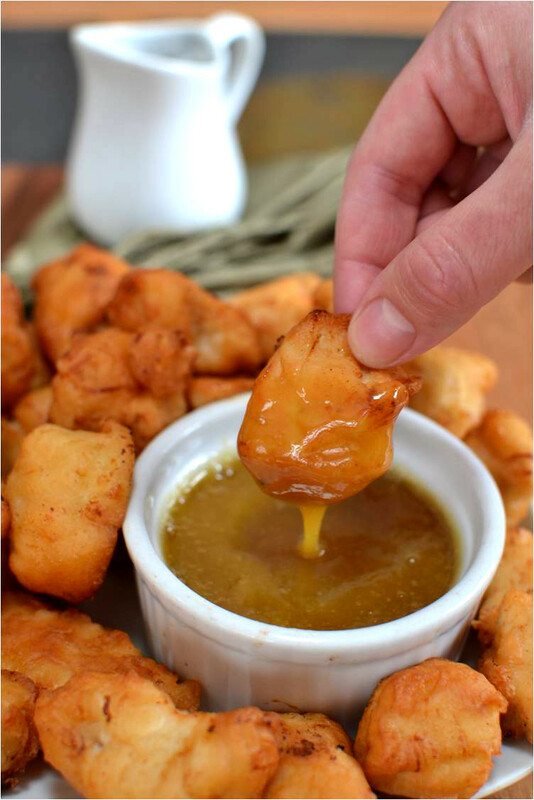 Drain the nuggets on a paper towel when removed from the oil. 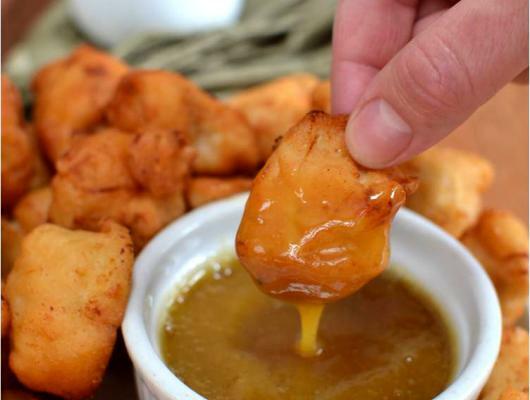 Juicy chicken nuggets surrounded by a mouth-watering maple waffle batter, dipped into a homemade honey/maple/honey-mustard sauce.